......... with our new foam animal masks! We LOVE these masks because they are so cute and colourul and fit children of any age (over 3 of course!). 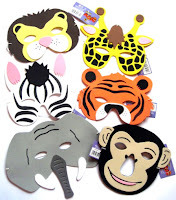 The zoo animal masks include lions, giraffes, elephants, zebras, tigers and monkeys. The farm animal masks include pigs, cows, sheep, rabbits, cats and dogs. Priced at just 60p each they are a great party accessory and would make a great alternative to a party bag for those working to a tight budget! Have a bag or box filled with assorted animal masks. Each child picks a mask out of the bag, then has to put it on and act like that animal. Or you could hold an animal treasure hunt. This will need some forward planning but is great fun. Have the children each pick a mask from the bag. That mask becomes "their" animal. Before the treasure hunt starts you would have made lots of animal themed cards and hidden them around the room! Each child has to find as many animal cards as he can that correspond to his mask. Naturally, if there are lots of children, then more than one will have the same animal, so make sure you do LOTS of cards! Do junk-filled party bags make you sick? If so, then you might want to read my first Squidoo lens! For those that don't know, Squidoo is a place where people can write their own pages (lenses) on absolutely anything! It's totally free to use, and is a great place to publicise anything that you care, or know, a lot about. My first lens is on the subject of junk-filled party bags. I want to show people that they CAN provide good quality party bags to their guests, without having to fill them with sweets and additives, and plastic bits of tat that fall to bits in minutes. Hopefully, I've shown a few good ideas, and will add some more products over the next couple of days. Now included in our big Winter Sale are many end of line items from the girls' party bag filler section. 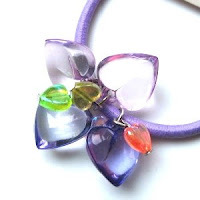 There's never been a better time to stock up on your hair accessories (bobbles, elastics, slides, clips, grips and hair bands) and fashion jewellery (necklaces, bracelets and bangles). Up to 50% off these fashion items means you can buy them at wholesale prices for your every day needs or for your party bags. Suitable for girls from the age of 3 through to teenagers, we''re sure you will find something to suit the most discerning tastes. You can see all our sale items, including these hair accessories, and items of fashion jewellery in our SALE section. "I am currently working on three new background themes and need suitable photos of children to work on them. "GIRL theme: ‘Popstar’ – For this theme I will ideally need one or two girls standing, taken from a front view – they will need to be full body shots. Feel free to dress your children up for this one in popstar outfits! BOY Theme:‘My Robot Friends’ – I will need a good clear photo of a boy taken from a front view - full body shot, seated or standing....possibly with arms out to either side so they could be draped around a robot next to him! ALL PHOTOS SUBMITTED MUST BE BETWEEN 500KBS AND 4000KBS (4MBS) IN SIZE and I will also need your full permission to use the completed enhancements and original photos for my galleries and marketing purposes. I will select the most suitable photos for each theme, and the winners will receive a completed 8x10 digital version of their enhancement in thier chosen theme. I look forward to receiving the entries!!" They are also currently running a JANUARY sale, enhancements are being offered at a price of £12.50 for up to 4 children in a theme of your choice - for a limited time only! Winter Sale - 50% off selected character party ware! There are some great savings to be had this year because we are clearing the decks and need to get rid of items that will not feature in our plan for 2009 and beyond!. 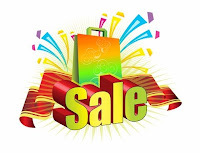 50% off solid coloured partyware (plates, napkins, cutlery, bowls and cups), and also 50% off selected character themed party accessories (blowouts, bubble sets and balloons). The characters featured in the 50% off sale are: Dora the Explorer, Spider-Man, Lazytown, Roary the Racing Car, Disney/Pixar Cars and In The Night Garden. If your little one is a fan of these programmes, then there's not going to be a better time to grab a bargain, so why not stock up now? There are also various party bag fillers in the sale too - and more coming soon! You can see all the sale items here. New animal themed party bag fillers now in! We've just made some exciting new additions to our party bag fillers section. Animals (especially those of the creepy crawly variety) are always very popular because they have a wide appeal with both boys and girls, and we are sure our new arrivals will prove to be no exception. Firstly we have our hilarious rolling tongue animals. 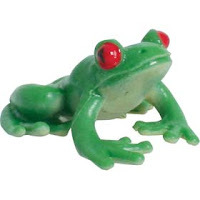 These rubbery critters are substantial in size and in a variety of species and bright colours. 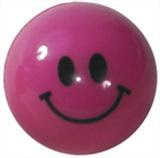 Each animal has a comic face, and when squeezed, it releases its tongue in an amusing manner. They are strangely appealing to both boys and girls (and adults...!). You can buy them here. 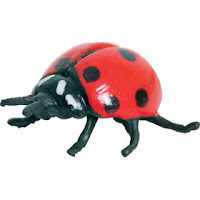 Next we have some tiny plastic rubbery ladybirds. They measure approximately 2cm, and are very finely detailed and surprisingly appealing. Perfect for party bags of an insect, natural world nature. You can buy them here. Finally, similar to the ladybirds, we have some tiny plastic frogs! Again, measuring approximately 2cm, they are finely detailed and amazingly tactile and appealing! You can buy them here. Our friends at Pink Fairy Cake have given us this wonderfully simple recipe for pinwheel sandwiches - which work really well with party buffets - for both adults and kids! They have lots of other free recipes which are perfect for cooking with children, so check them out! Gives a new twist to plain sandwiches and perfect for the kids to help with too! Cut the crusts off the bread and flatten each slice with a rolling pin. Chop the ham into small pieces and mix it into the cream cheese with a wooden spoon. (Add the parsley and red pepper if you are using it.) Spread the cream cheese mixture over the slices. Start at one side and roll up the bread like a swiss roll. Wrap in cling film and put in the fridge for 1 hour. Remove from the fridge and cut into slices. For more party food ideas, visit the party information pages at Funky Dory Party Bags. Click here. Pink Fairy Cake are currently holding their 2009 NEW YEAR SALE. They sell all you need to make cooking with kids fun! Their range includes silicone bakeware, cookie cutters, kids' baking utensils, funky cake cases and sprinkles, aprons and tabards, recipe books, Cupcake gifts and much more! To see what they have to offer click here. This new filled party bag is made up of our own personal favourite toys, so we really hope our customers like it too! Wind up the clockwork frog and watch it whizz around the table or across the floor. It seems to go on forever. Great for frog races! The animal jump up is an all-time favourite. Press the animal head down and wait until the rubber seal pops open and it springs into the air! Assorted animal species include frogs, ducks, rabbits, dinosaurs and many more. Not suitable for children under the age of 36 months due to small parts. 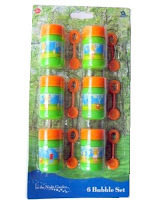 We're often asked for party bags suitable for babies and toddlers, and we now have some delightful squeezy baby toys which are suitable for babies ages 3 months plus. 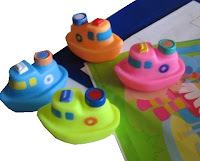 In 4 bright pastel colours, they are very tactile and squeezy and are perfect for bath time fun. They have a wide appeal with the very young, and our 4 yr old boy is very taken with them, so they are suitable for babies through pre-schoolers and beyond! You can buy them in singles for only 50p each, or in pre-filled party bags. Happy New Year to everyone! I think 2008 brought new challenges to lots of us and 2009, if we listen to the forecasts, looks like being much the same, if not worse! 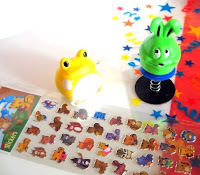 However, we at Funky Dory Party Bags are committed to offering the very best prices for customers, especially in these financially difficult times. 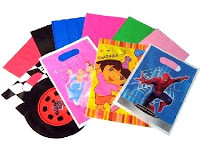 We are still delighted to still be able to offer filled party bags for as little as £1.00 each. Products in this range include the filled fairy party bag, the filled princess party bag, the value boys' party bag , the value skeleton warriors party bag and the value girls' party bag.